Well, hello and good morning! How was your weekend? Is it just me or is this walk into Monday feeling a littleeee more like a crawl? As a nail polish hoader collector, by this point in a given year I'm usually knee deep in the newest collections and eying up what the fall colors will look like. But after the insanity of moving my polish collection across international boarders? Yeahhhhh. I think I need to focus on using and loving what I already own for a while. For you, that means you'll get a lovely peak at some older, gorgeous shades that aren't super saturated in the nail blogosphere! Woo! For me, that means showing a little love to the negelected beauties sitting in my polish stash. Case in point? China Glaze's Fiji Fling and Zoya's Zuza. Fiji Fling was one of those pinks that just kept sitting because, well,....I just had too many other pinks to choose from! Before the big Canadian move, though, I de-stashed a ton of polish and passed them along to a few wonderful (and very willing) gals in my life. With a few less pinks around, Fiji Fling stood out from the bunch! This shade leans a little more coral than what my camera captured, but I love it! It's got a touch of that lit-from-within quality that you more often see in richer, darker shades. If you can find it, definitely scoop it up! If not, this more recent China Glaze release is just as good :). With Zuza, I was 100% convinced this shade was blue. Like, "hand-to-heart", "swear on everything holy", "fly the skies and walk the seas" swear that this shade was blue...until I put on my nail. Zuza's formula is wonderful and this color gives me all of those mermaid vibes. 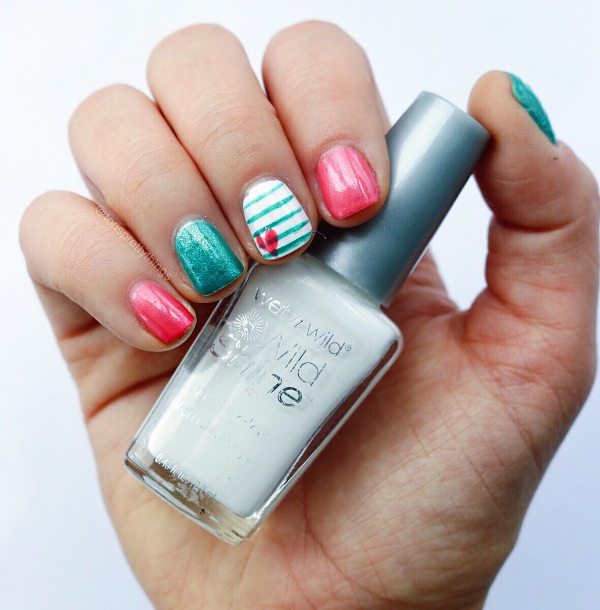 So if mermaid nails give you all the heart eyes, go scoop this polish up. When it comes to the art, I need to pat myself on the back for a moment. Can we just appreciate that I finally succeeded in drawing a heart on my nails?! I know, I know. It's kind of ridiculous that this is the first heart in my mani files. But I'm going to be frank - drawing a heart was such a challenge for me! It's such a simple design but the struggle was real. So, finally (FINALLY!) I succeeded in creating a heart mani. 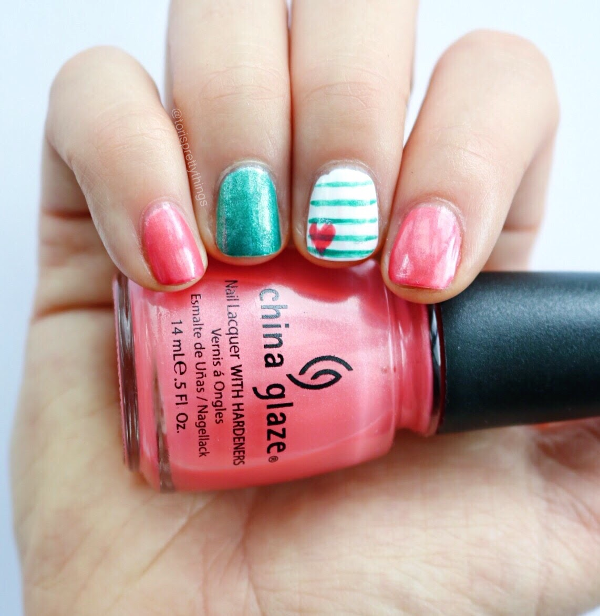 Thanks to this pin for being the nail art inspiration that helped me succeed :). Now I want to hear all about your Mani Monday! Are you more a fan of Fiji Fling or does Zuza catch your eye? What's on your nails this monday morning?